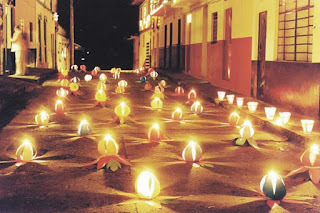 Today is the Day of the Little Candles, a day of celebration in Colombia in which small candles and paper lanterns are placed pretty much anywhere a candle or lantern can be placed. Today's prompt is to write a story of no more than 50-some words. Write a story of up to 50 words on the theme of 'winter feast' for the Scottish Book Trust's free monthly 50-Word Fiction Competition. Deadline: Tuesday, 11 December. Write a story of exactly 53 words on the theme of 'contradiction' for Press 53's free monthly 53-Word Story Contest. Deadline: Sunday, 30 December. Happy writing, and best of luck if you throw your hat into any of these rings! Keen to support National Flash Fiction Day? It's never too early to start thinking about what might want to send to our 100-Word Microfiction Competition! We'll be opening for submissions in early 2019, but in the meantime, you can read last year's winners.